28 | December | 2010 | Through the seasons before us..
A trip back in time..
Usually Reds fans of my age lament missing out on the European Cup winning era – but they might have overlooked an earlier side of significance. It’s one I’ve mentioned a few times, and having missed out on the late 70s and early 80s it’s one I most definitely missed out on. Thanks to the generous Tikabooson, I had a chance to relive the 1959 FA Cup Final in full. The first thing that strikes you is obviously the black and white coverage – a Wembley Stadium with no advertising hoardings, and just a lone commentator talking about – well, the match! No inane babble from a clueless sidekick, no instant replays, and only occasional reminders of the scoreline by way of on screen graphics – not so much as a clock on screen. In terms of the game itself – well, much has changed – tackles from behind, use of elbows did result in freekicks when spotted but little else, backpasses to the ‘keeper – indeed, even goalkicks were often played to a defender and back to the ‘keeper for a long punt, there appeared to be men having a picnic near one o the corner flags – goalkeepers were afforded very little protection! Those are the differences – much of the game hasn’t changed as much as you’d think. I saw nutmegs, stepovers, backheels – Forest played an offside trap and a fast-paced counterattacking game. I suppose the formation they played would be very close to the 4-3-3/4-5-1 you often see today. Forest played some excellent stuff in the first half – a really hardworking and talented side. Forest take an early lead – Imlach plays a great ball to Dwight who lashes it into the net. Wilson doubles the lead after not too long – shortly before taking a firm clearance into his gentleman’s region. Legendary commentator Kenneth Wolstenholme was a little more diplomatic in his description of why Wilson might have found himself writhing in agony on the floor for a while. Moments after Luton taking the worst corner I’ve ever seen (and I’m a Forest fan, remember!) a long clearance heads towards Dwight who collides with Town defender McNally. The referee waves play-on, Imlach taps it out of play and the physio is summoned – amazingly even after this the intent is to carry on before Dwight collapses again and is stretchered off. It turns out with a broken leg! There aren’t any substitutes back then, Forest play on for more than half the game with ten men. Luton don’t throw the ball back to Forest, as is clearly not the custom yet – Forest don’t do so either later in the game when Luton appear to put the ball out of play when McDonald is down injured. Another classic Wolstenholme moment is his apologising for the periodic score caption reading ‘Notts Forest’ – commenting that there’d be no need to write in and complain now! With the lack of modern acoustic recording equipment the crowd noise is very much in the background so you can’t really pick up much beyond the cheers and a dull background noise, aside from a moment when you can hear the Forest fans singing ‘Robin Hood’! As the game wears on the Reds tire and make more mistakes, and pick up injuries too – Burkitt had been on the deck, Whare was also troubled by a knee problem. Both played on, but the increasing pressure from Luton paid dividends, a short corner wasn’t anticipated allowing the Luton left-back to put a ball in which found its way to Pacey at the back stick, who makes no mistake. Chic Thomson in the Forest goal didn’t have a great deal to do in the first half – but was on hand to make a smart save from Luton’s Morton. Allan Brown – who would go on to become Forest manager – threatened our goal with a strange diving header but missed the target. He would ultimately become the man that sold Duncan McKenzie to Brian Clough’s Leeds United – only to find himself replaced by Brian Clough shortly after! Forest were suffering with a lot of injuries and cramps – although there wasn’t any real foul play at all. Gray was a victim of cramp for Forest and was moved out to outside left whilst Imlach switched to outside right. Brown again threatened with a diving header but puts it wide with the final whistle beckoning. The assorted injuries conspiring to see referee – Jack Clough – add on a fair amount of time. Thomson needed to be brave again to make a save – and finally the whistle came to end the game and give Forest the victory. A real game of two halves – Forest totally dominant before Dwight’s injury and understandably less so after, although still eager to play decent counter-attacking football throughout despite being a man down for most of the game. 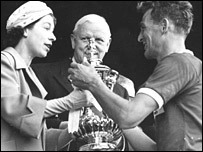 There were no ceremonies or messing around – the Forest team were straight up the steps for captain Jack Burkitt to claim the FA Cup from the Queen – as well as the medal for absent Roy Dwight. The runners-up followed, finally Jack Clough and his assistants collected their medals and that was that. I quite liked the no-nonsense approach to coverage compared to what we endure now. Whilst replays have benefits to help you see what happened, this approach was more wholesome somehow. There were times when it seemed clear a throw-in was given the wrong way – Wolstenholme didn’t challenge the referee, he just faithfully reported what was occurring. Whilst there wasn’t much by way of contentious decisions, the players never challenged the referee either. It just goes to show, the game has changed in many ways – often for the better, but this was a real eye-opener to see that much hasn’t, these were skilled players – athletic and brave – and of course, these were players that earned comparable wages to the hundred thousand people crammed into Wembley Stadium to watch the match. It really is worth watching the match.